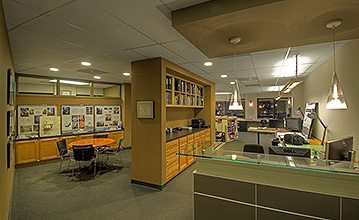 DW Ricks Architects + Associates (DWRA) is an Arlington, VA based full-service Architecture firm. We specialize in well designed, highly crafted, single-family residential and community buildings. DWRA is known for being an approachable and easy firm with which to work. We value our clients as collaborative partners. They are instrumental in helping to shape our work and we strive to make each and every client enjoy the design and construction process as much as we do! Founded in 1988, DWRA's commitment to residential work has made us a leading home design firm in the DC Metro region. We are recognized by numerous design awards, publications in leading shelter magazines and featured in newspaper articles and television. DWRA has designed and built over 200 residences to date. Representative projects include new custom homes, whole-house remodels, additions, condominium interior remodels, and preservation of historically designated homes. In addition to our residential work, DWRA has designed major additions to historic church & religious buildings, swim clubs, community centers, and commercial office buildings. Projects are found throughout the metro region including Virginia, Maryland, Washington DC, and Delaware. Our office is conveniently located in the heart of Clarendon, 3 blocks from both the Clarendon and Virginia Square Metro Stations. Pre-design is an initial information gathering effort to help insure the project parameters are clearly defined and understood before an agreement is written. The architect will discuss a range of issues to help insure the owner fully understands the project constraints and limitations prior to executing a contract. Typical issues vetted include: assess zoning and other local covenant restrictions; review impact of historic designations; develop a thorough wish list of work and a realistic corresponding budget; evaluate the existing house and/or property conditions; and create a realistic timeline for the entire project. Once the project parameters are defined and agreed upon, a standard AIA agreement is prepared for the owner's review. For renovation and new construction, design begins with a thorough inspection and site assessment. For renovation, a survey of the existing house is completed. All relevant building and site data is then entered into our CAD file. We utilize ArchiCAD, an object based CAD system, to enable full 3-D modeling throughout the entirety of the project. The first design meeting includes site analysis and several alternative conceptual designs for the client's evaluation and comparison. A preferred design is then selected and developed into Schematic Documents including drawings and an outline specification. DWRA then arranges for 3 independent contractors to prepare preliminary construction cost bids. DWRA will also prepare their own independent in-house estimate for comparison. Once the preliminary bids are reaffirmed, the project moves into the Design Development stage. Areas of detailed design include all interior spaces. Large scale plans, details, and interior elevations are developed for the kitchen, bathrooms, furniture plans, casework, built-ins, and millwork (trim). While the interiors are developed, showroom visits are arranged for selection of cabinets, counter tops, tile, lighting and plumbing fixtures. In addition to detailed design and material selections, the building systems are also developed. An energy evaluation is prepared to establish the desired level of green design features and framing / foundation plans are designed. The Construction Documents are comprised of both construction drawings and written specifications. These documents are a thorough and detailed representation of the final "work". They include general construction information and codify all project design decisions and material choices. The "Construction Documents", are an American Institute of Architects (AIA) legal designation which carries the obligation to define the entire project's scope of work. These documents serve to protect the homeowner's interests throughout construction and provide the ability to solicit competitive "Guaranteed Maximum Price" final bids from multiple contractors. DWRA will organize final bidding, construction contract negotiations, and then oversee the construction phase. Oversight includes regular on-site construction meetings, Q&A & progress correspondence, review & approval of all contractor invoices, and monitoring of construction and overall schedule. DWRA will then close out the project with owner/contractor AIA forms including Substantial Completion, Affidavit of Payment of all Subcontractors, Contractor's Release of Liens, and Final Completion. Prior to expiration of the 1-year construction warranty period, DWRA will contact the homeowner and contractor to arrange an on-site meeting to review and prepare a punch-list of warranty repairs. In addition, DWRA will query the homeowner to determine overall satisfaction and functionality of the design and systems. A copy of all annual utility bills will also be requested. The information is then entered into the DWRA data base to verify energy design effectiveness and projected energy cost savings. DWRA is an independent Architect working directly for the homeowner. We can work with any bona fide remodeler or residential contractor a client chooses. However, DWRA has cultivated long-standing relationships with local general contractors who look to bid on our client's projects. It's important to remember that a contractor will likely only do one project for the homeowner, but, he may do 10-30 repeat projects for the Architect. This architect-contractor synergy greatly benefits the homeowner. Since these contractors look to DWRA for work, they are highly motivated to charge competitive rates, fulfill the obligations of the construction documents, meet schedule deadlines, and please us by pleasing our clients. Further, these contractors have completed multiple projects with our office, maintained a continuous practice for 10 or more years, and come pre-qualified with outstanding independent references for client consideration. At any given time, we work with 5-6 different highly qualified contractors. Since DWRA performs all project and client management, we recommend contractors who offer construction services only. This is a very important distinction to understand. Design/Build and similar contractor business models include staff and overhead for design, client & project management, and other pre-construction services, in addition to construction services. The contractors we recommend offer construction services only! Utilizing this work model insures substantively lower construction costs with no redundancy between architect and contractor services.